Following the Rebels’ victories against Samford and then-No. 18 Oklahoma State last weekend, the Ole Miss softball team is on a seven-game win streak, sitting at 21-7 on the season. 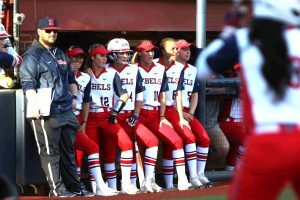 Although the Rebels got off to a rocky start, losing six games in the first three weeks of the season, they have improved tremendously since and have only lost one game this month to then-No. 14 Arkansas. “To be a returner and know how it felt to get swept by (Arkansas) last year and to open up playing them the first SEC weekend this year and to take the series from them at home feels amazing,” sophomore Jessica Puk said. The Rebels’ success has been bolstered by an explosive offense. Throughout the season, senior Kylan Becker has consistently been a standout at the plate, leading the SEC in hits and triples. Becker currently has a team-high batting average of .460 that ranks seventh in the SEC. Additionally, Becker is ranked in the top 10 of the SEC for on-base percentage, runs scored and stolen bases. Earlier this month, Becker was named SEC Player of the Week after her standout performances at the plate against Pittsburgh, Nicholls State and Central Arkansas. Becker went 11-17 while scoring 7 runs and batting in another 7. Becker recorded 1 double, 1 triple, 1 home run, 2 walks and 5 stolen bases. This past weekend, Becker broke the single-season record for triples with 6 on the season and became the Ole Miss all-time leader in career triples, with 13 overall. Puk and senior Brittany Finney are currently tied for the team-lead with 6 home runs apiece. Junior Molly Jacobsen set a new career-high with 11 strikeouts against the Oklahoma State Cowgirls. Jacobsen has pitched 66.0 innings this season and has struck out 66 batters and walked 9 to earn an ERA of 1.17, the best on the Rebel squad and the fourth best in the SEC. Jacobsen, a Des Moines Area Community College transfer, said the level of talent in the SEC is a step up from junior college. Despite her success so far this season, Jacobsen said she doesn’t feel any added pressure from her teammates to perform at that level. This weekend, the Rebels will travel to Columbia, South Carolina, to face the South Carolina Gamecocks. The Gamecocks’ record matches the Rebels at 21-7. The Gamecocks will rely on their offensive stars to try to end the Rebels’ win streak. Sophomore Jana Johns is currently batting .432 with 32 hits, 6 home runs and 25 RBIs. In addition to Johns, six other Gamecocks are batting over .300, and the team has racked up 40 home runs this season. Defensively, the Gamecocks’ pitchers have a 3.08 ERA and have given up 77 earned runs — 30 more than the Rebels. The first matchup between the Rebels and Gamecocks will take place at 1 p.m. Saturday. The following two games will take place at 5 p.m. Sunday and 6 p.m. Monday.